The herb is primarily known as a culinary herb, it is especially used a lot in Mediterranean cooking. Interestingly the Journal of food science published research that showed rosemary could extend the life of omega 3 rich oil. In 1235 Queen Isabella of Hungary was given a concoction of rosemary with wine to cure a paralysing illness. Today this mixture is known as Queen Hungary's water and it is used for baldness and gout treatment. It is also used for diarrhoea, burns, colds, obesity, bronchitis, flatulence obesity and headaches. Rosemary oil is available in several forms, fresh or dried, tincture and essential oil, it can also be taken as an infusion. A compound named carnosic acid found in the herb by researchers at the Sanford Burnham medical research institute, helps eye health by protecting the retina from deterioration and toxicity and toxicity in cell culture (cell culture-cells grown outside their natural environment. From these findings it is suggested the acid may be used for diseases which affect the outer retina, such as macular degeneration. The study can be found in he journal Investigative Ophthalmology & Visual Science. A study done by researchers in Switzerland and France on mice using leaf extracts showed it could protect against liver and limit weight gain that was induced by a high fat diet in mice. The leaf extract was given to the mice for fifty days, the mice were also given a high fat diet. View the study in more detail at pubmed. Rosemary is usually a safe herb for most people to take but exceeding more than the recommended dosages can cause harmful side effects, such as spasms, vomiting, fluid on the lungs and coma because of the oil content. Undiluted oil should never be taken orally. 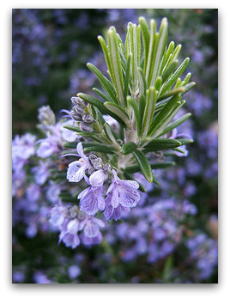 Pregnant woman should not take rosemary as it can cause a miscarriage. If you have any of the following ailments, high blood pressure, ulcerative colitis, Crohns disease, or ulcers do not take the herb.